I set out to find a material I could cut easily and that came in sheets bigger than readily available foam core board (which is actually available at Dollar Tree in case you don't need something bigger - $1 is a great price!!). 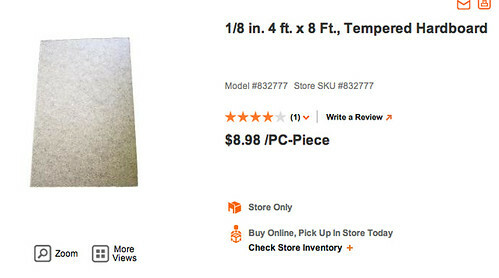 I ended up at Home Depot because I'm pretty sure they have everything I could ever need when I don't know what it is. While pricing out plywood, I came across hardboard which ended up being exactly what I needed. It is easy to cut with a jigsaw, holds paint well and is just sturdy enough to make all sorts of stuff out of it. I made a bunch of signs, flames and an explosion. The hubs mounted them to the house using special nails made for panelboard. I recommend these because they hold on to the thin wood really well. I tried using the nail gun for part of the project but they all pulled through the hardboard. 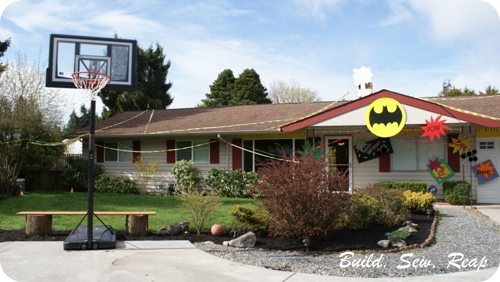 The bat signal had to be front and center since the Snicerdoodle was dressed up as Batman for the party. I cut out flame shapes for above the garage and two of the front windows, there's an explosion on the chimney and then you can see the various comic bubbles throughout. And stepping back, here are some pictures of the rest of the house. 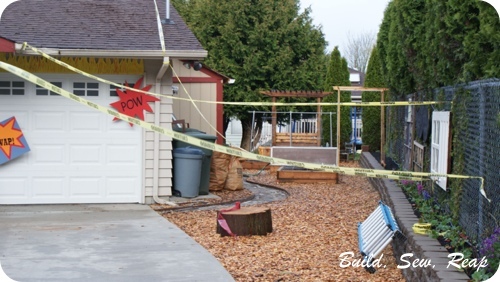 The hubs picked up some caution tape that he strung throughout the property. Originally we were just going to use a little along the back of our property so the kiddos wouldn't wander into the neighbor's yard but the roll was so big, he just kept going with it. It definitely gave the house a look of chaos, as if the villains really had attacked. It was so fun! We also picked up a gigantic inflatable Spiderman on Amazon and inflated it ourselves using the air compressor. We didn't want him to be helium. He looked great on the garden side of the gate I just made (going to have to post about that too). It mostly kept the kiddos out of our garden which was what we were aiming for. I think he even scared a few people (insert evil laugh). This was pretty easy to put together. 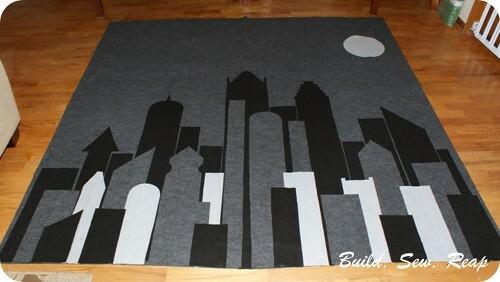 I figured out how big to cut the background then just started with black buildings, moved on to dark grey, then light grey then did a mix at the front. I was really happy with the end product. I also added a bat signal before it went up on the wall. The signal is also felt but the light beam is organza that I painted with Mod Podge before cutting it out. I just laid it on some freezer paper and coated it well, let it dry then cut the triangle to serve as the light beam. 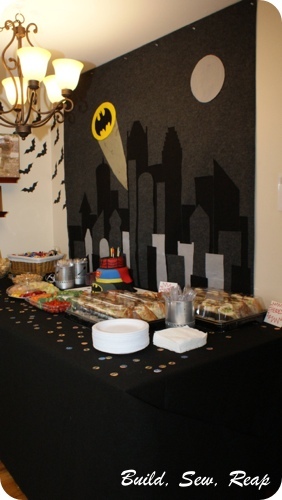 At the Snickerdoodle's suggestion, we used our Halloween bats throughout the living and dining rooms to decorate the walls. We also had some helium balloons and streamers. 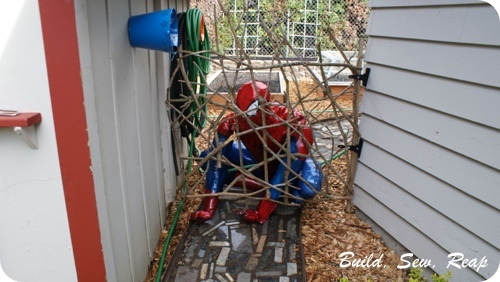 I thought the place looked great and the kiddos really seemed to enjoy the superhero theme. Up next - the cake!! Whoa! This is incredible! 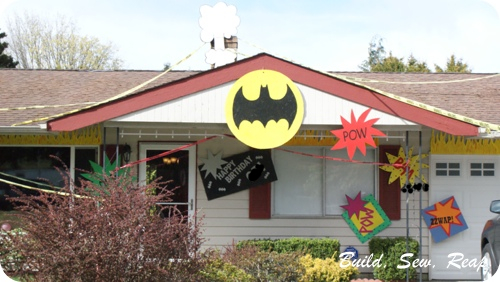 Love the painted felt and the house signs and Spiderman! What a party! Thanks Michelle!! I just reread and am glad you commented because I didn't paint those buildings, they're all just rectangles and slightly altered rectangles cut out of felt and glued down. It was even faster than paint would have been (easier with 2 kids and a cat too - paint projects can't be this big!). Amazing jump rent many outdoor toys that can assist children. you can rent different type of inflatables from this company and arrange an exciting party into your own house backyard. Our inflatable bounce house is very exciting for kids.